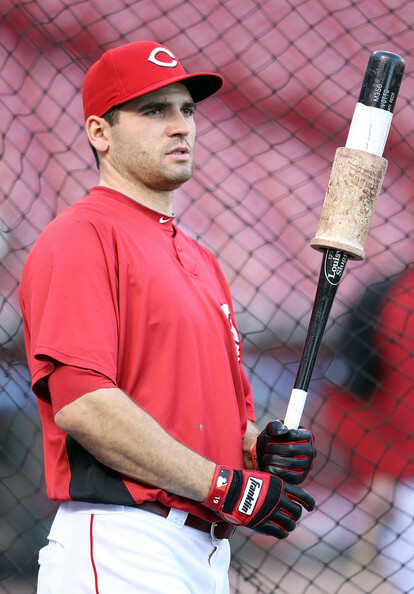 In his first four years, Votto has compiled 4.0, 4.7, 7.3, and 6.9 WAR seasons, earning himself the NL MVP in 2010. Votto's success at the plate is achieved primarily through two traits. First, his plate discipline is extremely refined, and his advanced approach allows him to consistently get into favorable hitter counts and spray the ball all over the field. Second, Votto has a quiet stance and a quick and level swing, which generates a ton of line drives. Votto's 2011 batted ball statistics (27.5% LD, 39.1% GB, 33.4% FB) differ greatly from those of the notorious upper cutter Prince Fielder (19.8% LD, 43.1% GB, 37.1% FB). A high line drive percentage like Votto's will result in sustainably high batting averages despite what appear to be fluky BABIP numbers. Votto has plus power, but is more of a 25-30 home run hitter with a ton of doubles than a true 35-40 home run slugger, despite what his 2010 totals suggest. He is a solid to above average defender and an average runner. 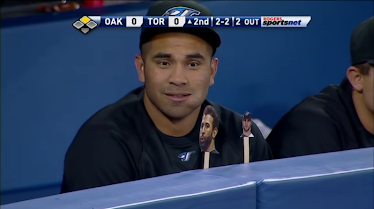 The list of reasons why Toronto (or anyone) would want Joey Votto is bordering on endless. He is in his prime and is one of the best players in the game, while under contract for two more years. Toronto has a glaring hole at first base with Adam Lind having exposed his ineptitude at the plate. Votto would be a monstrous upgrade for the club, as he could immediately join Jose Bautista to create the best 3-4 in baseball and push Toronto into serious playoff contention. Additionally, Joey Votto is a Toronto native, and his acquisition would create a buzz around the Blue Jays that hasn't been heard since the World Series years. The contract extension would be expensive, but Toronto could easily afford it, especially when considering the marketing opportunities. It's extremely farfetched that the Reds would trade Votto, because he truly is one of the best players in baseball and is only 28 years old. If Cincinnati does make him available, it's likely because of money. Votto is owed 9.5M in 2012 and 17M in 2013, after which he becomes a free agent. He has stated numerous times in the past that he is not interested in a contract extension that would buy out his free agent years, which suggests he has no interest in staying in Cincinnati longterm. Given that he'll likely command an Adrian Gonzalez-esque contract, it's doubtful Cincinnati could retain him even if he wanted to stay. The Reds have a ready made replacement for Votto in former 7th overall pick Yonder Alonso. If they were to move him, they would likely demand a package that would upgrade their pitching staff with young, controllable talent.